Desert rock legend BRANT BJORK premieres new song ; upcoming album « Mankind Woman » coming September 14th on Heavy Psych Sounds! Better swagger & sway, as BRANT BJORK has come to revive your rock spirit! The godfather of desert rock – who recently announced the release of his 13th solo album ‘Mankind Woman’ via Heavy Psych Sounds – has just unleashed another stunning track via Consequence Of Sound today! BRANT BJORK enlightens us about the songwriting process: « Swagger & Sway is the perfect song for those who like to move with a little attitude in their groove. As far as songwriting goes, Swagger & Sway was kind of an anomaly. Bubba came up with the guitar parts and upon first hearing them I was instantly into the vibe and direction. It was one of the first songs we had on the table and I assumed it would be a fairly easy song to assemble based on its classic feel and groove, however, in the end, I wouldn’t describe Swagger and Sway as a piece of low hanging fruit. It was more like a piece of low hanging fruit that we had to patiently wait for it to ripen. Both Bubba and I have an affinity for 60’s music and these particular guitars he presented was a healthy example of all we enjoy from the era.The first thing we worked on was the groove. It’s a groove that has to snap, crackle and pop and at the same time flow and not be too busy. This is something easier said than done. I first attempted tracking the song on my early 60’s Rodger’s kit but found that my pocket was a little shallow do to the smaller size drums. I finally ended up using my Ludwig rock kit (same used with Kyuss, Fu Manchu, etc.) and instantly had a way deeper pocket and a much longer swing. This discovery helped us to commit to use my Ludwig on all but one song on the entire record. Once we had the groove correct, we put together a rough arrangement that we sat on, while I came up with lyrics and melodies. This is when things got interesting. 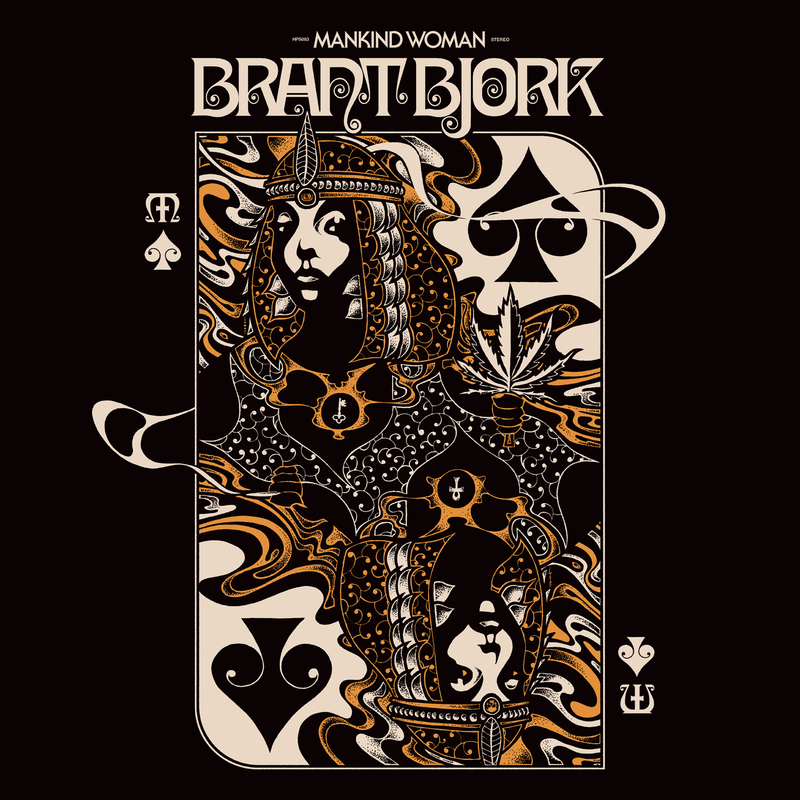 Although « Mankind Woman » is indeed a BRANT BJORK record, it is the first record Brant so closely collaborate with a producer and co-writer; his Low Desert Punk Band guitarist and friend, Bubba Dupree. Brant and Bubba wrote and performed the music along with guest appearances by bass player Armand Secco Sabal, Nick Oliveri and vocalist Sean Wheeler who has been a touring member of the Low Desert Punk Band. The recording took place in March of 2018 at Zainaland, a creative villa owned by Brant Bjork’s wife, Zaina Alwan, in the California desert town of 29 Palms. The record was recorded and engineered by Yosef Sanborn who also owns and operates Massive FX pedals in Los Angeles. Multiple pedals designed by Yosef were used by Brant and Bubba for this record. Additional tracks were recorded by Bubba Dupree at Brant Bjork’s home studio in Venice beach California.Furthermore, Brant and Bubba describe the sound of « Mankind Woman » as modern classic. It is evidently clear that both Bjork and Dupree specialize in the craft of the sound and feel of the music spawned in the 60’s and 70’s. This record is inspired by this great era, however the intention was not to try to recapture or mimic in retro terms these influences but to strive for a contemporary quality. BRANT BJORK might have gone deeper in the lyrics than on any record before. Focusing on personal sensitivities, elite hypocrisies, racism, sexism and the daily struggle to find peace, love and understanding in today’s American society. Once again, BRANT BJORK created a record that reminds the listener that it is the ingredients of the jazz, blues and funk, that makes rock music taste so good. A must-have for all collectors, genre-fans and beyond! But this September also holds more exciting editions for all BRANT BJORK and genre-fans, that will make every collector’s heart beat faster: Heavy Psych Sounds Records has just announced to re-release the classics ‘Tres Dias’ as well as ‘Local Angel’ from BRANT BJORK’s back catalogue! « Tres Dias » is set for a re-release on September 21st, while the reissue of « Local Angel' » will be coming September 28th. US alternative heavy trio SNAIL reveal new song « Psilocybe » exclusively on Kerrang! Roman power trio FVZZ POPVLI to release debut album « Fvzz Dei » this September 22nd on Heavy Psych Sounds. Occult doom supergroup DEAD WITCHES present a Halloween special streaming for « Mind Funeral ». BLACK MOTH announce European tour with Antlered Man; « Condemned To Hope » out now. Le trio heavy rock psyché MARS RED SKY en tournée dès le mois de mars !